Consequences (intended or not) and pernicious effects of Truman Dam and Reservoir for residents of the upper Osage River. We received a fat envelope in the mail a few weeks ago that included an “open letter to the Corps of Engineers” which was published in the St. Clair County Courier in 1997. Written by Lawrence B. Lewis, a retired Episcopal priest, it’s an extended appraisal of the effect of Truman Dam and Reservoir on the residents of St. Clair County. Mr. Lewis’s family immigrated to the upper Osage River in the 1830s. Mr. Lewis was kind enough to supply this photograph, which shows his father, Bernard Reynolds Lewis (second from right), dangling his feet over the bow of a barge being pushed by a small steamboat called Rambler. B. R. Lewis served in the U.S. Navy in both World Wars I and II. 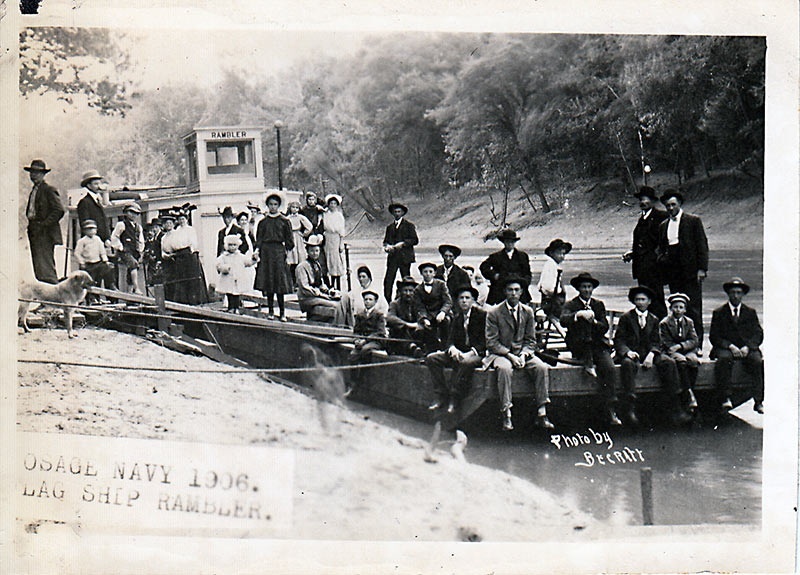 We’re assuming that this was an excursion about to get under way from Osceola to Monegaw Springs as we have a photograph (page 68, Damming the Osage) of an almost identical barge pushed by steamboat, captioned “Excursion – Osceola to Monegaw, June 20, ’09”. Becraft was an excellent photographer in Osceola in the early 1900s. We have a number of his sharp focus, technically excellent photographs in the book. 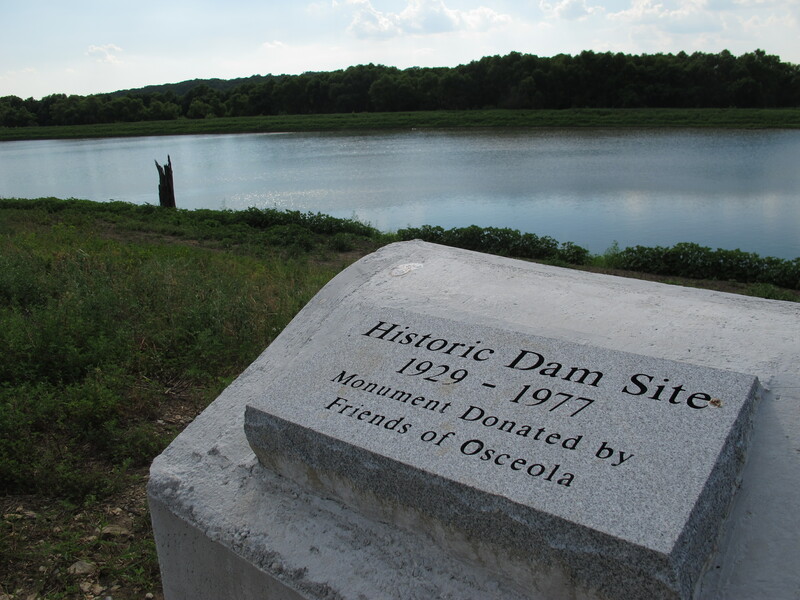 We always assumed that there were people suspicious of the benefits of Truman Dam in Osceola, but during the lawsuit promoters of the project drowned out their objections. Today, the situation is reversed and it’s hard to find a supporter. Truman Dam is widely recognized to have been a disaster for the town. In the September 11, 1997, issue of the St. Clair County Courier, you were quoted as inviting public comment about Truman Dam, after visiting here with our Mayor about the “delta” forming from silt accumulating in Truman Lake at Osceola, and attempting to put the best face on the situation that you could. As someone who has recently moved back home to Osceola because it’s where my wife and I want to live out the years of my retirement, Truman Lake mud flats and all, I’m writing to offer background and also proposals for action concerning the dam and lake. As Catherine D. Johnson stated in her letter in the September 25 Courier, plans for a new flood control dam date from the 1930s. Then shortly after the close of World War II a proposal was made to construct a flood control dam just upstream from Osceola. Eventually, after it was seen that much of the reservoir would be very shallow, a location was determined on at Kaysinger Bluff near Warsaw. My father, Bernard R. Lewis, who was born in Osceola in 1896 and died here in 1968, had both historical perspective and a keen interest in the Kaysinger Bluff dam proposal. B. R. Lewis had grown up on the Osage River. When in his teens, along with his brother Lawrence, he ran a passenger boat service between Osceola and the popular rustic summer resort of Monegaw Springs. B. R. Lewis told me that although the Osage had always flooded, really destructive floods began to occur only after water projects upstream in Bates and Vernon count1es turned meandering streams into straight ditches, and wetlands into crop land, shortly before World War I. The channelization enriched farmers there, but sent floodwater slamming down into St. Clair County and locations farther downstream in amounts not experienced before. My father’s take on it was that if it had not been for the upstream water projects, then runoff due to poor soil conservation practices especially during the Great Depression, Congress and the Corps of Engineers might not have thought about a large flood control dam in our region. There was considerable enthusiasm in Osceola for the Kaysinger Dam project in the 1960s. People will tell you now that it was because the Corps of Engineers deceived our civic leaders about the kind of lake the dam would make. I don’t buy that. My father, who was himself an Osceola civic leader, knew the elevation above sea level of the dam at Warsaw, looked at a contour map of Osceola, and figured out that, obviously, we would have mud flats. My guess is that if he said that to other civic leaders, they didn’t want to hear it. In their minds they saw a lake like the one at Warsaw now, because that’s what they wanted to see. Visions of tourism dollars danced in their heads, clouding their vision; but I really don’t think the Corps thrust “delta” predictions in front of their faces to bring them back to reality. Bernard Lewis was not the only one who did not catch the lake fever. A farmer downstream on the Osage filed suit with assistance from the Environmental Defense Fund (EDF) to stop the Corps from obtaining two farms which had been in the family for generations. The EDF was in 1ts early days, still headquartered in a little town on the north shore of Long Island. They wished to stop construction of Kaysinger Dam 1n order to preserve what was left of the free-flowing Osage River downstream from the old Osceola Dam and above the headwaters of the Lake of the Ozarks. The cover of one their newsletters featured a black and white photo of the Osage from a bluff top. The farmer and other family members were denounced in the pages of the county paper for bringing in “outsiders” to interfere with a worthwhile project, getting in the way of “progress.” My response was to join the Environmental Defense Fund. Now a quarter of a century later I still send yearly dues to thank them for defending a river that was important in the lives of my father, grandfather and the great-grandfather (Dr. Lawrence Lewis) who moved to Osceola in 1839. EDF, the farmer and his family and other litigants from the region lost in court. I’m not sure if their suit was related to the requirement that the Corps make a study of the cost-benefit ratio of the project. The hydro-electric power generators may have been added to the project to bring the benefits over the costs. Electricity would be sold to power companies in the heartland of America and the project would pay its way. The generators were added at great expense and soon proved to be partially unusable because of the massive fish kills caused by their pump-back feature. When he learned of this, I recall that Senator John Danforth termed Truman Dam “an environmental “disaster.” I was glad to hear a respected public servant to say what I’d been thinking. But there is more to it. In the 1960s my father wrote to at least one U.S. Senator to tell him (prophetically, I believe) that the purpose of Kaysinger Dam was to create “a settling basin for the Lake of the Ozarks” – at the expense of the loss to St. Clair County of its best bottomland. Yes, our flood control reservoir does protect the water level of the Lake of the Ozarks and its bi1lions of dollars of lakeshore investment; and we catch the silt. For those reasons I believe that Truman Dam will never be decomissioned, though I enjoy imagining it. In all fairness, I believe the Corps has changed since the 1960s. Someone pointed out to me that Truman Dam was one of the last they built. From what 1ittle I’ve heard, it sounds as if the Corps is beginning to have more respect for natura1 processes in the management of waters, more willingness to cooperate with nature rather than fight it. Also, I think they realize how upland conservation has begun to help prevent floods. You can, though, still expect to find an image problem among people in and around Osceola on the subject of Truman Lake. I respectfully offer two suggestions of things the Corps might do to help. Both of them have several sub-parts. –Flooding good bottom land on which farmers grew food to feed a hungry world. Tourist dollars at Warsaw mask the loss of America’s real wealth which was the land. — Forcing people from their homes and farms. I refer you to the works of Wendell Berry, Kentucky farmer and author, on the value of place; and again to Catherine Johnson’s letter in which she cites the pressure and sometimes deceptive methods by which citizens were displaced. Also, one sometimes hears comments on arbitrary and irregular “take” lines. –Flooding riparian forest that moderated our climate and served as habitat for an incredible community of biologically diverse animals and plants. Just go to the Sac-Osage roadside park on Highway 82 and look out over miles of country that used to be green and alive. The devastation pierces the heart. –Using the flood plain here to protect downstream investments after we had already been used by upstream farmers to receive the excess water they caused by destroying the wetlands which had stored water, then released it slowly. — Disrupting the life cycles of fish and other aquat1c creatures of the rivers and creeks of the many watersheds involved. — Destroying, in the town of Osceola, whole neighborhoods with tree-shaded streets and interesting late 19th century houses, many businesses and at least one church. Reducing Osceola’s populat1on by more than a third by destroying those neighborhoods. –Taking away the rai1road the depot served, thereby necessitating a few more pavement-destroying, life-threatening giant transport trucks on Highway 13. We don’t even have a rails-to-trails project to compensate for the loss of the railroad. Those are some of the things the Corps needs to apologize for. 2) Help us do the best with what we have left. That’s what you were trying to do when you explained to Mayor Booker about the “delta” (or “fen” as Vincent Foley proposes in his letter in the 0ctober 2 Courier. However, I agree with Jim Dill in his September 25 letter when he says weeds are what will grow there. Developing real bio-diversity takes a long time. It could be a lifetime before Osceola’s “delta” would be comparable to the Schell-Osage Wildlife Area, which is already well established. Be both smart and gentle in dealings with the City of Osceola. For example, we’ve been stuck with “park” land so abundant we’ll never have the resources to maintain it. Maybe some administrators could tithe a day a month to come work on beautification, for example, mowing. In spite of the loss of Osceola Dam, a fishing mecca, people still come here to fish. Use tax money to bankroll maintenance of Osceola Cove so both the RV Park put-in and the munic1pal boat ramp will remain usable. Do ongoing dredging to allow boats to get out into the channels of what in better times were the Osage River and its tributaries. The “delta” area will silt up but there will always be a channel. Be responsible, be accountable, use common sense and kindness in dealing with institutions here which will, it seems, forever be under some measure of Corps supervision. Figure that local people may know more about what’s good for them than people in offices somewhere else, though local support for building the dam shows that we’re capable of error. You don’t have to wait for Suggestion #1 to be accomplished before putting Suggestion #2 into action, though “Cooperative Community Discussion and Planning Meetings” will be better received after the Corps has brought someone from Washington to say it’s sorry for doing violence here, taking away so many things that can never be restored. By the way, if you bring water remediation expert John Todd to instruct me, I’ll be first in line to get in, before or after the apology. I trust I have provided background for understanding, food for thought and goals for action on the part of the Corps.